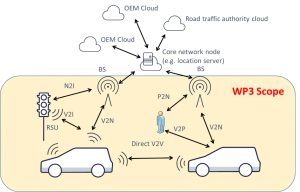 Develop an efficient and scalable 5G V2X air interface to enable ultra-reliable low latency communications (URLLC) between road infrastructure, vehicles and other road users. The radio interface covers both infrastructure-based and sidelink communications leveraging 3GPP solutions; Evaluate the individual enabling technologies with theoretical analysis, link and system-level simulations. Design Channel models for V2X communications. Channel measurements for massive MIMO adaptive beamforming. In terms of positioning, going beyond state of art, D3.2 includes 6 technology components that are essential for building positioning solutions needed to enable 5G V2X use cases. D3.3. Final V2X radio interface deliverable.